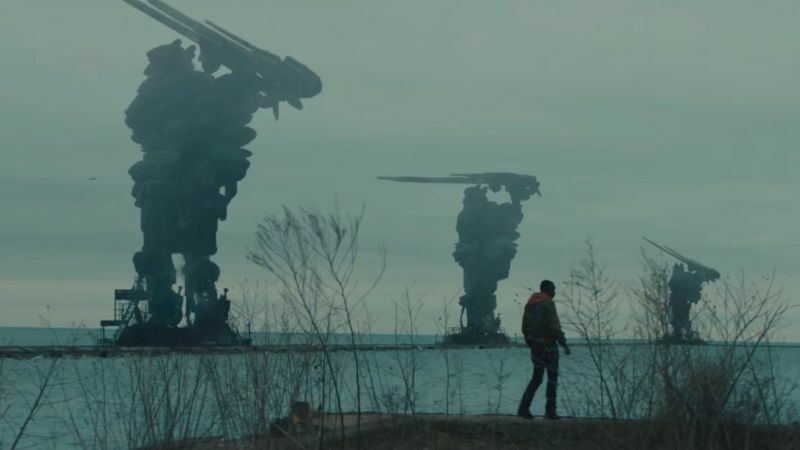 Write to Reals: Captive State – Did the film fix the script issues? Lazy writing – After we get the car chase/crash, we cut to a long introduction scene of a computer screen that literally types out exactly what has happened on Earth for the past 6 years (it could be 9 years, I tried to write it down in the dark theater, but now my notes look like scribbles). This was a lazy way to disseminate information/exposition and none of the information really matters to the plot – it all could have been implied or given via dialogue. Poorly structured – We start with a main character, then leave him for an extremely long espionage sequence with characters we don’t know or care about (minus the guy from The Exorcist series – which is awesome, by the way, and you should stop everything you are doing and go watch it on Hulu right this second!) who are planning to bomb a major event happening that night. Show the aliens too early – We literally get to see them close-up at the very beginning which was a mistake in my opinion. We could have just had the light that blasts the mother and father, then shadows creeping up on the boys and then cut to titles. In fact, we didn’t even need to see them at all through the entire film – though the design was kind of cool: a mix of the creature from Splinter and Swamp Thing. Seriously, if you have watched a movie in the last decade, you will see this reveal coming a mile away. Not that it totally ruins the film, as there is another surprise, however, if you pick up on the visual and dialogue clues, like: “Beware of Greeks bearing gifts.” the second reveal is also pretty easy to pick up – though highly implausible and a pretty big stretch if you think too hard about it. Felt like a prequel to a much more interesting story – Because of the poor structure and where we leave things (no spoilers) it just feels as if this film was a set-up for a far more interesting and coherent story that I don’t think we will ever get to see on-screen. No time spent establishing characters – As I stated above, we jump from a coming-of-age drama with a through-line about finding your place in the world to an elaborate Mission Impossible-style heist that takes up a majority of the film, but with characters with little-to-no backstory or reason for me to root for them. Stakes not established – Hank mentioned this as well: We know that the resistance hates these aliens… but we don’t know why. It actually seems like the aliens have kind of sequestered themselves and are doing their alien thing in the No-Go Zone. We are never given any real hint about why they are so hated, what they are doing to the population or the planet and why they need to be stopped. Actually, we only really ever see human-on-human violence, which it could be argued was the filmmakers trying to say “Hey, we are the real monsters here.” – except the story doesn’t follow through with that thread or theme at all. Now, don’t get me wrong, I’m not pro alien occupation, it just needed to be better established what was at stake and why the resistance needed to strike now. Their plan really didn’t seem that well-formed either, even despite all of the sneaking around. And there is an explanation given, but I still think that this film could have had its cake and eaten it too if the plot were more focused on why the aliens were so terrible and what the resistance was fighting for. Previous articleWrite to Reals: Crush the Skull (2015) – Horror/Comedy Done Right? Next articleDragged Across Concrete – Another S. Craig Zahler Success? Best Friends Vol. 1 – Come Indulge Your Morbid Wiseau Curiosity!